1. “Grant Park: three years later” was the initial vision for this article—a snapshot of the stark difference in Chicago’s political and emotional temperature between the downtown celebration of Barack Obama’s election night in 2008 and the Grant Park arrests in mid-October of this year. But this comparison doesn’t begin to get at what’s interesting about Occupy. Because of what I will call its “aesthetics” as well as its size (at last count, more than seventy American cities have an Occupy protest, not counting the strength and scope of related protests abroad), the protest, or movement, depending on how you look at it, is very much that—an amorphous, sprawling political form that looks different from every angle and every subject position, like Wallace Stevens’ blackbird. That American mainstream media is unable to cover Occupy in any kind of coherent, proficient way is well-documented, but even as a single observer it was nearly impossible for me to take any kind of clearly articulated position about Occupy Chicago without immediately realizing I could make a strong case for an opposite view of the phenomenon (and usually I had heard someone do so in an interview). News stories are breaking more quickly, and with less clear consequences, than can be covered by print media. Then there’s the Twitter- and discussion-board-fueled communication from the protest itself, which make you feel perpetually two steps behind all of its news. And ultimately, in the dozens of interviews I had with activists, academics, artists, students, bystanders, cynics and Occupy agnostics, everyone ended up talking about the form of the movement most: non-hierarchical, cacophonous, rhizomic. Partially we do this because it’s easier to talk about the general shape and aesthetics of the thing than the moving target of its endless news stories, victories and losses. But is this a new kind of movement, and if so, in what ways? 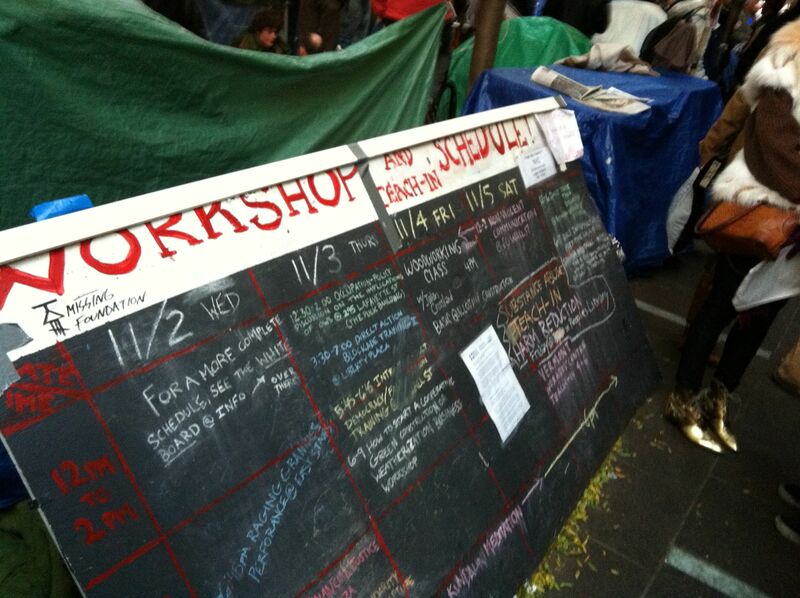 How can we frame Occupy, in Chicago and elsewhere? Why is it so difficult to feel like you have a handle on understanding Occupy? Is this an intentional effect, and if so, what does that accomplish? The word aesthetics could mean the protest’s literal form, a catalog of how it looks from a dozen angles, and a catalog of the art and even beauty involved with its practices. 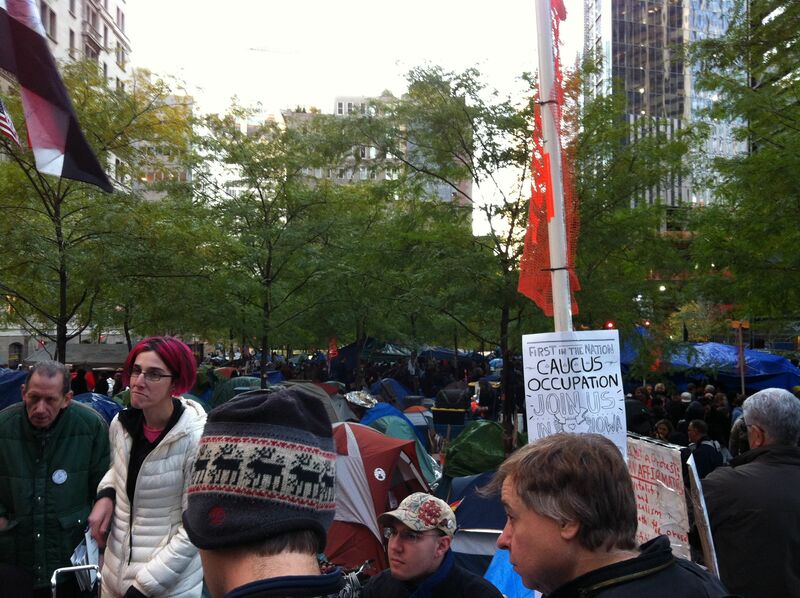 I ask: What are the aesthetics of Occupy Chicago in particular? These questions attempt to come to terms with Occupy as it unfolds in real time through social media and, sometimes secondarily, in the street. 2. “Rhetoric”: The writing classes I teach to college freshmen focus on rhetorical analysis—breaking down and evaluating arguments. We had some free time one week, and my students in a night class decided they wanted to see one of Occupy Chicago’s General Assemblies and analyze its rhetoric. The next week, we spent one of the last warm evenings of fall in front of “the horse” on 500 South Michigan, watching the semicircle of the 250 seated protestors that made up the human microphone that night perform seemingly endless announcements about Twitter accounts and meetings, a circle of bored police officers looking on, as the wind blew the pages of students’ notebooks and they strained to catch the human mic’s utterances. When we returned to the class, the students were deeply critical of what they saw. They couldn’t see how signs about ending war, freeing Assange and a seemingly incongruous Palestinian flag could be reconciled into a coherent position. A few brave students had talked with Ph.D. philosophy students who spouted post-Marxist theory that seemed to have little to do with the issues. “There’s no main claim to anything they said tonight,” one announced. “You always say we need to focus on specific issues,” another noted. “They didn’t get that specific about very much.” “The human mic has some serious rhetorical constraints. It seems to just create self-censorship,” mused another student, “because they’re probably not going to say something that people won’t want to say back.” The class decided that if the General Assembly were a text, it would be full of rhetorical fallacies and generalized claims, a nebulous argument and little audience awareness. This is, of course, the main criticism waged against the movement. “What if that lack of definition were intentional?” I asked a student who stayed after class to talk with me about it. “I don’t know, then they should make a poem or something,” she said. 3. “Simulacra”: The criticisms my students voiced partially comprise a familiar refrain of most of the discussions I had with nonparticipants about the message of Occupy movement. Jim, a consultant at the Swedish Trade Council who passes Occupy on the way to work, echoes the common feelings of those simultaneously sympathetic to but deeply alienated by the movement. “They can’t form a coherent message or build some sort of leadership structure,” he observes, which is tragic as well as “cynical” because the issues are “so, so important.” “There’s no end game, no specific demands… just uninformed complaining… abject cynicism, and directionless anger. All successful protests at least think they can change something and have specific plans.” Case in point: Jim, and several others I spoke with, have heard people make reference to how this movement is just like Tahrir Square, “which couldn’t be further from the truth. The protestors in Tahrir wrote out a list of fourteen actionable demands and hung it on an eight-story canvas over a building in the square. 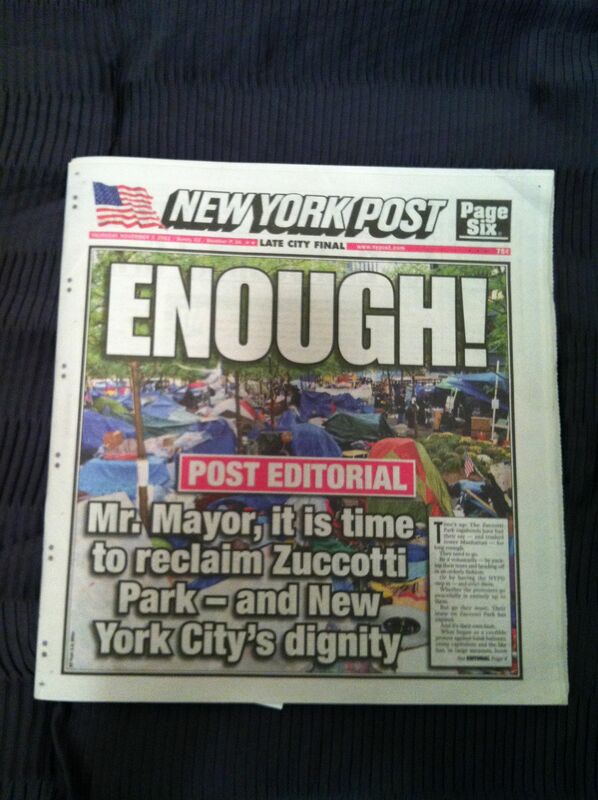 I would be thrilled if folks in Zuccotti Park went and did that (with demands like overturn Citizens United, separate commercial banks from investment banks, raise the capital gains tax, etc.) but it will never happen. They have the style of a protest down, but they are missing the substance part. Style gets you noticed, substance gives you the ability to change things,” Jim argued. One bystander, whose name I never got, mumbled that the march was a protest “simulacra”—first Plato and then Baudrillard’s word for a copy of something that, for Baudrillard, later becomes a copy without an original—an empty form. And at worst, that’s how Occupy Wall Street feels: a simulacra of what we’ve named the “Arab Spring” (an already fictional label), but a hollow version. When it creates more spinoffs, it loses more anchorage in the granular reasons for why we usually protest in the first place. 4. Sublime I: On the flip side, the lack of focus in the early stages means less chance of nipping its potential power in the bud, and many protestors I interviewed spoke of this diffuse orientation as a benefit to the movement. Peter, a graduate student in sociology at the University of Chicago, is both deeply involved in the protest and intellectually interested in the way that Occupy Chicago, and the Occupy protests in general, have “really attracted a degree of attention in the media in the way that other, larger protests haven’t.” Peter sees this attention as due to both the seriousness of the current crisis as well as in large part to the movement’s open-endedness. “It hasn’t restricted itself to specific reform, legislation or endorsement of candidates… it’s opened up a space in which people from a variety of perspectives can share ideas, try out tactics, and reach out to existing organizations on the left. That’s been the most positive thing I’ve seen so far… I think that if these networks persist to some degree, if we can sort of plant a seed in an enduring way, then it will be a positive, constructive thing.” Peter does believe that the movement “needs to transfer into other arenas and struggles if it’s going to become a more lasting transformation,” but for now, many protestors seem satisfied by not getting pigeonholed into a crystallized position that can then be shot down or written off. And there’s a deeper way in which the movement’s lack of focus and amorphousness also gives it power—the lack of an outlined plan makes it scarier. 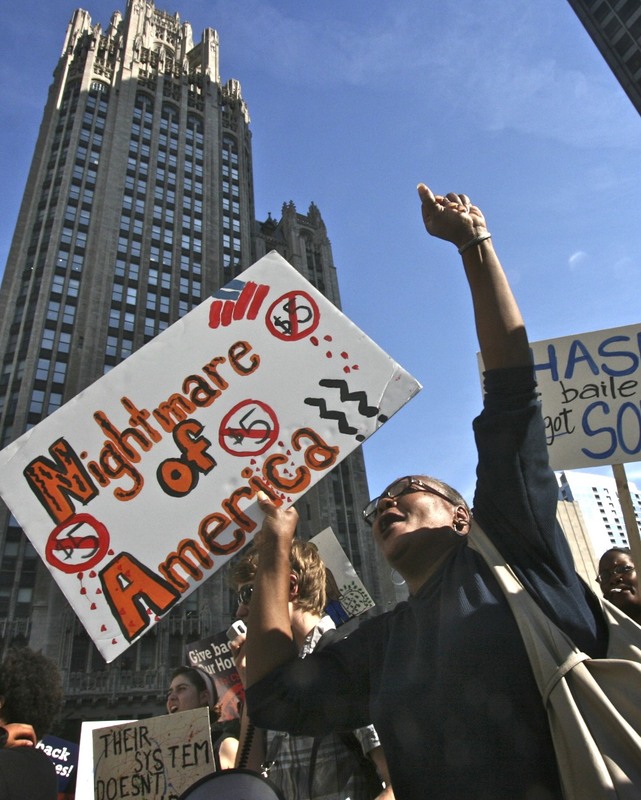 While currently the protest, in Chicago at least, is peaceful, it’s not difficult to imagine that, given its global network and scale, a huge amount of energy is readily available to focus on a particular place at any point in ways that are literally nonviolent but potentially vigorously effective. A huge, networked group of people, making connections all over the globe, united by a free-floating anger without any particular target in sight—it invokes a sense of the sublime. The sublime is that which is overwhelming, frightening and in some sense unrepresentable or inaccessible, unable to be understood and encapsulated. The sublime here lies in Occupy’s sheer raw energy, ready for harvesting during a time when fears of global unrest are high. Add to that the reality that many of the protestors are unemployed students who face little prospect for a job after graduation, and you’ve got a mass of potential power even more compelling in its lack of overt identification. 6. The occupation will eat itself: The form of Occupy may match the scope of its aims, but the form also demands constant upkeep and maintenance that diverts energy that could and probably should go elsewhere. Jacob Cayia, a member of the Marxian, Chicago-based Platypus Affiliated Society, has done three teach-ins so far, most studying the politics of ancient Greek civilization and modern society. He says his motivation is in large part to resist some of the movement’s assumptions about democracy and capitalism. “There’s this idea floating around that all you need is a space to be democratic, and that you can fight capitalism through moving your money to a credit union,” Cayia notes. “In my teach-ins, I’m trying to show that you can’t just create a democratic community on a sidewalk—or at least not one that works.” Cayia’s teach-ins attempted to critique the idea of direct democracy styled on the Athenian public assembly of citizens: “What would it mean for us to make decisions like this in our daily lives? We’d be in meetings all day.” Cayia sees the movement’s need to “maintain a constant occupation” as “more a sign of weakness than success. This occupation movement needs to continuously sustain itself, and in my opinion, that’s a misplaced energy.” By creating a movement running on inertia and energy—a politics of enthusiasm—the protest is always in need of fresh energy and fresh enthusiasm. It can’t run on dialectic and argument. 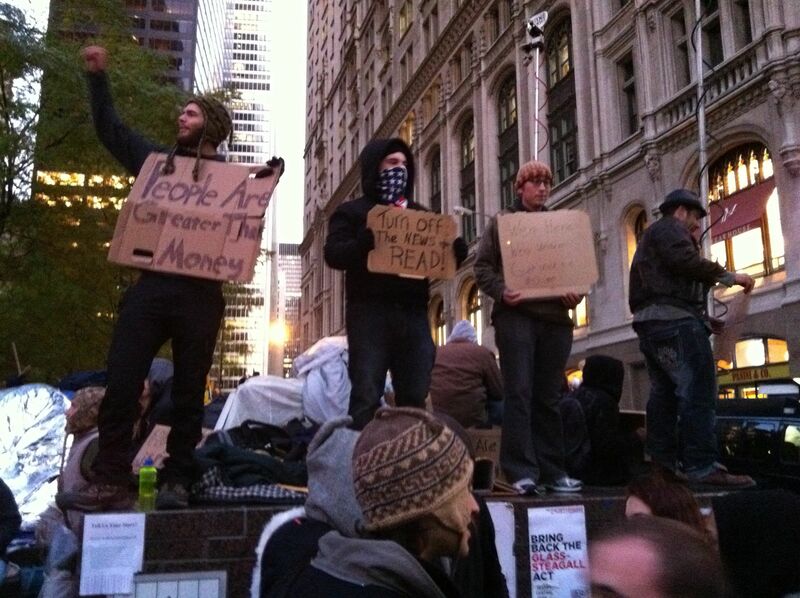 When I ask Cayia if he sees Occupy as having an aesthetics, he nods. “Yes, and that aesthetics takes on a subjective expression of anger that finds no other suitable outlets, so it sort of congeals on this spot on the sidewalk, with other people yelling and banging on drums… It’s constantly trying to enthuse and inspire the crowd, but these acts have no other ends but sustaining themselves, which I find exhausting.” At worst, Occupy Chicago seems to be a fetish of democracy that creates a grueling need for endless deliberation and negotiation, a need that inhibits the political work it could be doing. 7. 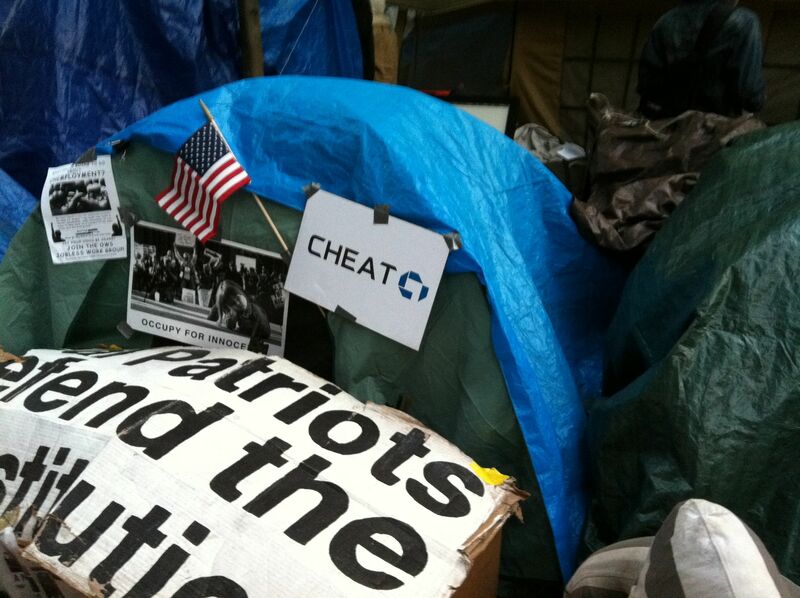 Aesthetics of Inhabiting: A number of observers (and op-ed writers) seem to find the most noteworthy thing about Occupy, particularly in New York, to be the often-elaborate encampments it has created, encampments that of course need constant maintenance. While some applaud the tidiness of these spaces, someone visiting Zuccotti Park observed to me that the physical occupation is like “playing house.” From another angle, the sheer act of inhabiting—the tent cities elsewhere, the occupation itself on Jackson and LaSalle here in Chicago—is an aesthetics with its own built-in politics. Tricia Van Eck, a former Museum of Contemporary curator who is currently curating a city-wide art show about political happiness and has traveled to a number of Occupy sites, compared Occupy Wall Street to Yoko Ono and John Lennon’s bed-in. She quotes “The Occupation Cookbook,” a manual for the organization of occupations based on a 2009 faculty occupation in Zagreb, Croatia. The manual says “The actions termed ‘occupations’…are really re-occupations, a renovation and reopening to the public of a space long captured and stolen by the private interests of wealth and privilege… The goal [is] to make them truly habitable…a place fit for living.” For Van Eck, the problem with Occupy Chicago is that, because there’s no permanent legal home for the occupation, it doesn’t have “the luxury to be ‘domesticated’ and is forced to be on the move, so it can’t organize in the same fashion.” The current issue with physical inhabiting is, of course, the 11pm curfew laws in public parks, but the other big issue ahead is the changing weather. It’s getting cold, and what happens when winter comes will affect all the occupations—but probably Chicago the fastest and the most strongly, overnight tent city or no. At this moment, the question of what will happen when protestors can’t stand outside all day is looming. Cayia says that there has been talk of having people sleep in a warehouse, which shocked him: “Are we going to create a kind of homeless shelter? That impulse is bizarre.” But the question of how to sustain Occupy and keep it visually inhabiting the city a month from now hangs heavy. Meetings with the city’s Corporation Counsel at the end of October to find a permanent home for the protest have led nowhere so far. 8. Relational Aesthetics Van Eck’s comparisons between Chicago and other cities bring up another relevant question, which is whether Occupy Chicago stands alone as a protest, is simply a satellite protest to New York or its own independent movement. The other major question of relationship is to what extent the movement is going to involve unions and other already-established activist groups, which have so far been scarce. Rebecca Zorach, an activist and professor at the University of Chicago says, “I’m not sure how much the Occupy movement realizes they are able to do what they’re doing in part because of the hard work, over many years, of activist individuals and groups around the city building a culture of dissent. This movement is doing something unique and I can appreciate and learn from that, too. But I am a little worried when I hear people insisting that if anyone wants to work with Occupy Chicago, they need to come downtown, come to a General Assembly. Not everyone can do that—for any number of reasons. I think Occupy Chicago needs to go out into the neighborhoods, not to evangelize, but to learn about and offer support to the struggles that people have been fighting here for decades.” Tied into this question is the question of how much Occupy Chicago (and other Occupy protests outside of New York) should take up local issues to stay relevant, and how to work with unions that can help maintain a real sustained occupation in the coming months. 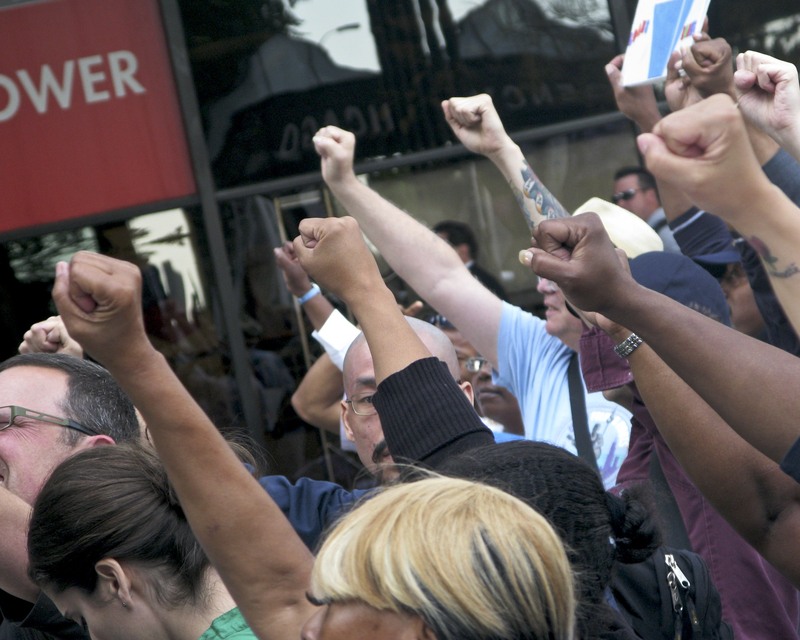 Unions—most recently, the nurse’s union—bring good press to Occupy, but the particular goals of unions don’t always line up with Occupy’s headier goals of creating a new community based on economic and social equality writ large. The form of Occupy will be in large part determined by how they form relationships with other cities, as well as with local causes, unions, and organizations. 9. 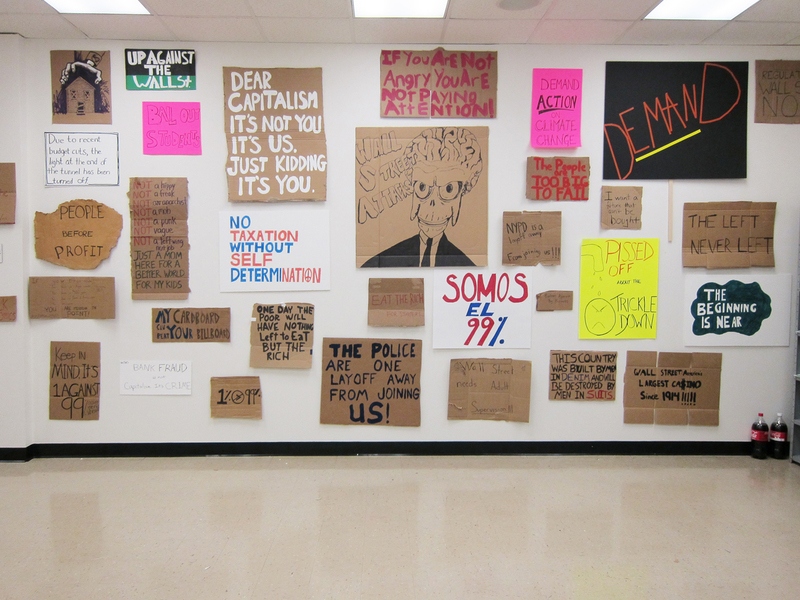 Art of the Protest: Jason Lazarus, a Chicago-based artist and currently an artist-in-residence in Tampa, Florida, is literally trying to curate the protest nationwide by recreating hundreds of cardboard Occupy signs in a massive archive. 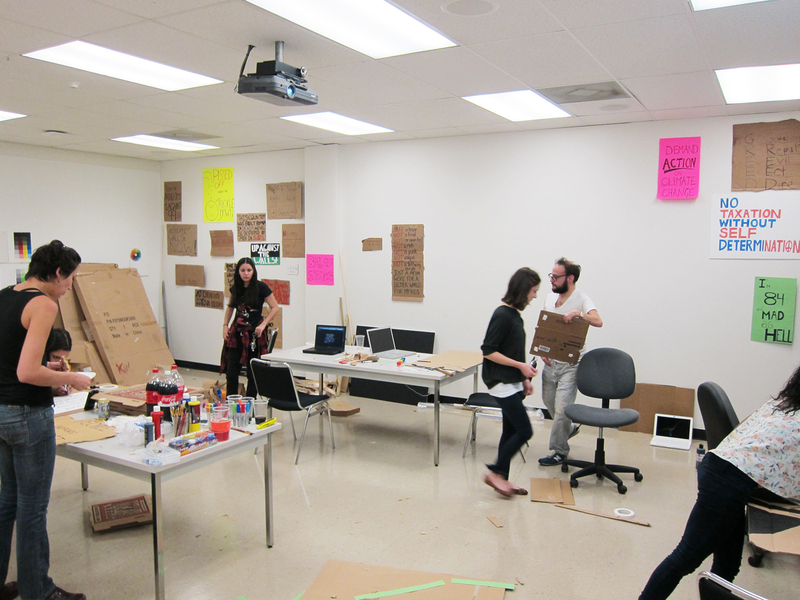 Lazarus combines new and old media to recreate the signs, finding images online and then working with his art students using cardboard and markers to create exact replicas. “They start physical, then go to the Internet, then become physical,” Lazarus muses, in a way reflecting on the protest’s growth as a whole. Art, for Lazarus, is a “great counterpoint to the precisely produced polished world,” and in the signs he is able to see an “inferred narrative, resilience.” The signs, he says, “couch the cacophony of voices.” The archive project also forces the artist to “slow down in reading” a subject that he feels the need to constantly “refresh my understanding of, almost like a webpage.” The movement overall has a strong artistic impulse, from the endless cardboard signs to screen-printing projects, many of them acting to convey information about each city’s online networking sites. 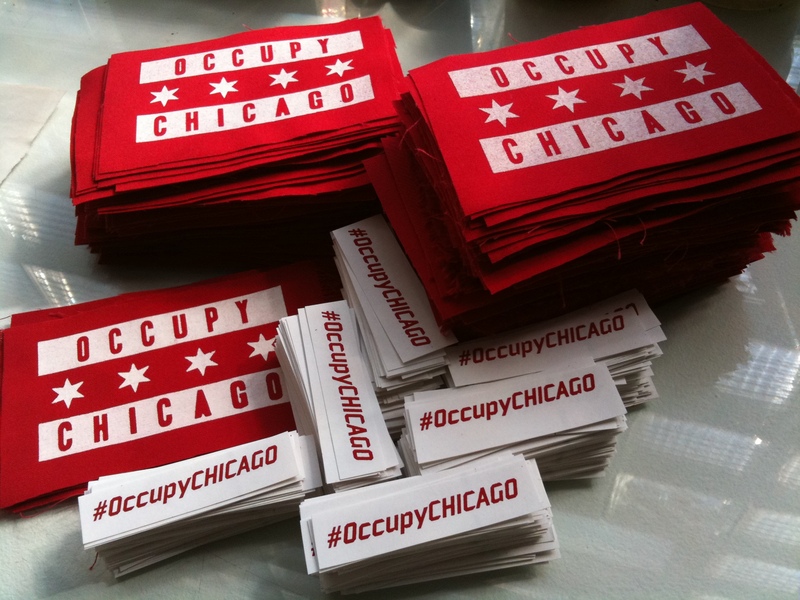 Chicago artist Erica Weitzel has been making patches and stickers for Occupy Chicago, many of them with hashtags corresponding to Occupy’s Twitter account. Weitzel found out about the protest from the anticonsumerist Toronto organization Adbusters, and she immediately did an inventory of how she could help. “I think it’s really important to tap into our own individual talents to contribute to the cause, since it’s such a diverse group. I wanted to help out so I looked at my resources. I have studio space at a printing press so it only made sense that I put that to use. It’s all very DIY, but so is the movement.” What inspires her to keep making them? “It is really beautiful to see people so passionate about the common good and do away with some of the apathy in this country.” Finally, of course, a strong component of all the art involved in protest is performance art. 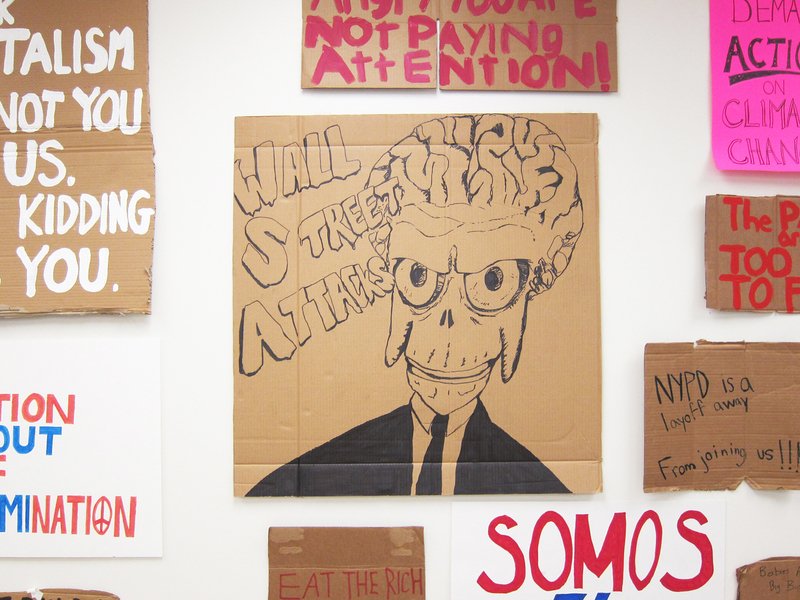 Protesters create aesthetic visibility in order to gain political visibility. 10. Visibility, invisibility: My activist friend Rachel is taken by the leaderless aspect of the protest: “I was there when the movement decided not to meet with someone from Rahm’s office and one thing that was made quite explicit was that while there are leaders in the movement, it is not focused on any single agenda or mobilized by any single group. I think that there is a lot of power in this… Of course, this resistance to being pinned down also poses its share of risks. The goals and interests of Occupy aren’t effectively communicated to those outside of it, let alone to those who are opposed…” Because there are no explicit leaders (though there is a core group of organizers, many of them graduate students, which becomes clear after just a few interviews with people involved), it’s somewhat institutionally invisible for those bodies that would regulate its actions, legally and otherwise. The human bodies and signs that make up the protest are visible, but little can be done to them except through displacement. The movement is thus both profoundly visible in terms of its pure presence and somewhat undetectable in other ways. The protestors are right there, under our noses as they march daily by the buildings where we work, and we have to walk by them to get to the train; but they’re not promoting any candidates or attacking any political figures in particular, and there’s going to be no figurehead or scapegoat. It’s easy to have a long conversation with a protestor without hearing any proper nouns about those involved. It’s also easy to speak to dozens of protestors without feeling you’ve gotten any sense of what the protest looks like. In other cities, the Guy Fawkes mask has taken off as a symbol of the anonymous carnivalesque revolutionary. 11. New Media revolution: When someone called the 2011 Egyptian Revolution the “Twitter Revolution,” criticism fell immediately and hard, but a mythology of social media as revolutionary organizer was born. 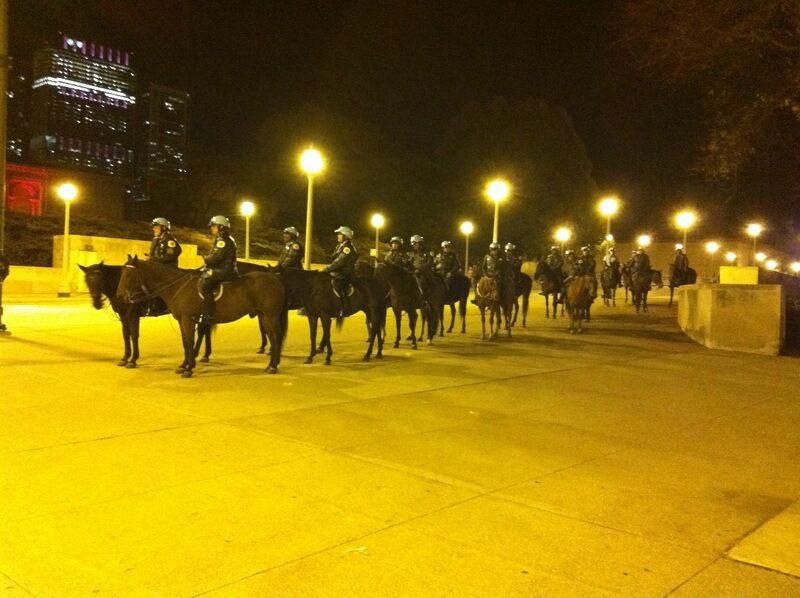 The first night of the Occupy Chicago arrests in Grant Park on October 15th, Twitter was alight with updates from protestors. Karen Looney, who was arrested that night and the following week, remembers chanting, “The whole world is watching!” as police officers warned them of imminent arrests. “Our Tech team livestreamed the event until the last person left. There were so many arrests that the CPD had to bring in CTA buses to transport us…” Much has been made of the fact that Occupy has bypassed mainstream media coverage to self-broadcast through Twitter, Facebook, and listservs. For all the talk I heard of starting conversations during interviews, the Occupy Chicago protestors seem particularly controlling about media dissemination of their messages, and information about the protest and its goals is much less a conversation than a monologue, 140 characters at a time. The Occupy Chicago website is particularly well-organized, with schedules, discussion boards, and fliers up for distribution. Calls to occupy the Internet and virtual space are more popular everyday, from GIFs that people can use to protest corporate websites to countless discussion threads and social networking platforms. One website has set up a system to email CEOs of the corporations blamed for our current economic disaster. 13. Cleaning Up: On Guy Fawkes night, I’m walking to get my bike, which I’ve kept locked up at Jackson and LaSalle all week, to go see a play on the North Side. It’s Saturday evening on November 5th, which is also declared Bank Transfer Day by Occupiers: They’re urging people to move their money from the big banks to smaller banks and not-for-profit credit unions. The weather is cold and crisp, a reminder that winter is coming and the movement may soon be going into hibernation. I’ve accidentally arrived at the beginning of a pre-assembly march, involving many more people than I’ve seen so far—it looks like there are a few hundred protestors. I stand on Jackson writing down quotes from signs I see into a notebook: “Too Big To Fail Is Too Big.” “Pay Us Back.” A couple of young construction workers in hard hats stand next to me taking pictures with their camera phone, and one of them comes up to ask me what I’m writing down. I show them my notes. A professorial older man comes up to the two of us and asks the construction worker guy in particular what he thinks about the march. “I think it’s great,” he answers. “They’re doing it for us. We’re all union, and if this stuff didn’t happen in the twenties, we wouldn’t be where we’re at.” The older man asks about the police. “The cops don’t care,” the construction worker answers, laughing. “It’s overtime for them. That’s how they see it.” At this exact moment a police officer rides by on a bicycle, a cup of coffee secured in his front basket. The older man tries to start a conversation about politics, but the construction worker has already walked away to get back to his job. As I unlock my bike, feeling at least for a few moments some sincere hope or at least a sense of coherence, I see protestors who haven’t joined in the march sweeping the sidewalk. They remind me of lines from Wislawa Szymborska’s poem “The End and the Beginning”: “After every war/ someone has to clean up/ Things won’t/straighten themselves up, after all…Photogenic it’s not/ and takes years/ All the cameras have left/ for another war.” I stand and watch them, and somehow, even though they’re only sweeping up detritus their fellow protestors have left, I find it more moving than any of the marches and speeches I’ve seen in the last few weeks. 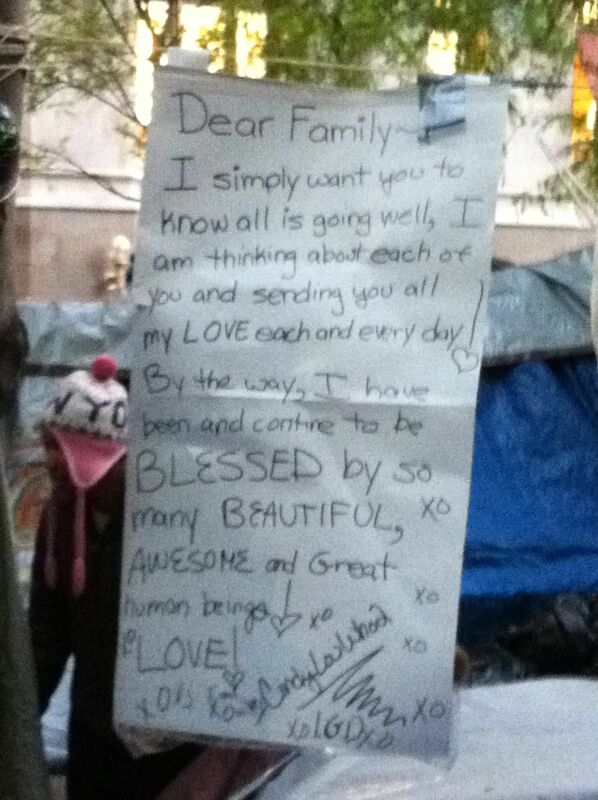 It’s the quiet work of cleaning up that turns out to be the most moving scene of Occupy, and I never make it to the play.